I’m participating in The Kitchen Cure for the next two weeks. I’ll track my progress here, and in this flickr set of before and after photos. Today’s assignment was to deep clean. The Day 4 assignment assumes you’ve finished going through the fridge and freezer, and all the cabinets, drawers and closets where you store food and cooking equipment. So, the natural next step is to clean everything else. I’ll get there, but I need more time. I really wanted to take a break tonight, but the difference this is making in the kitchen is very much worth it, so I kept going. But at this point, I’m just making a point of doing a little bit every day. It’s easy to break this into small chunks – either by identifying particular things to focus on – “these two cabinets” – or making a time limit. Tonight I decided that I wanted to finish up with whatever I focused on by about 8:15, which would give me time to get the kitchen back in a usable state by 8:30. To that end, I focused on two easy cabinets and wound up doing a bit more with the drawers. I’m continuing to reorganize with an eye towards putting things I use often in easy-to-get-to spots, and stuff I don’t use often in less convenient areas. So, tonight that meant I started pulling things out of cabinets I haven’t worked on yet. 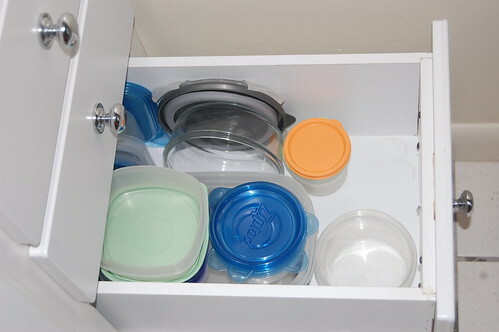 For example – I moved the linens and I now have a drawer dedicated to the Tupperware I use most frequently! This may seem like a silly thing to you, but I think it will make a big difference for me.